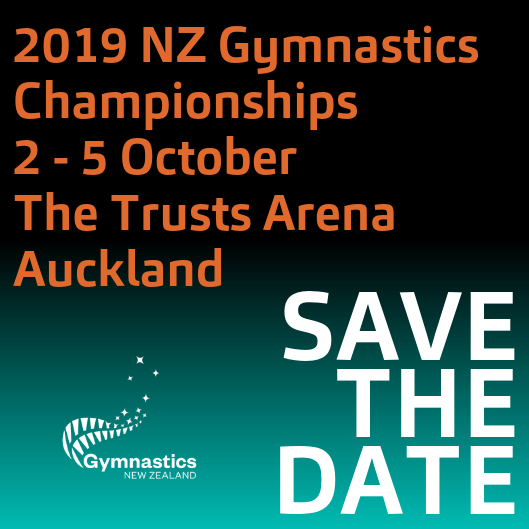 We are pleased to announce that the 2019 New Zealand Gymnastics Championships will be held at The Trusts Arena in Auckland from 2 – 5 October. Once again, all five codes will be competing together under the one roof in what is sure to be an outstanding week of competition. We are excited to be returning to the first-class facility that is The Trusts Arena, and look forward to delivering a high-calibre and memorable event for all involved. We hope you can join us in October to celebrate the top athletes from across the country at our pinnacle event. Stay tuned to our Facebook page to receive updates. Note: Additional international training sessions will be worked in throughout the competition schedule. Please note that all amounts are GST inclusive. *This year there is only one entry fee for Trampoline athletes. This covers multiple disciplines so long as the athlete has qualified and been registered in each event. Please note that 2019 entry fees include what was previously known as the "judge fee'. Submission of entries: entries will only be accepted from the Provincial Coordinators. They will not be accepted from clubs. International entries will be considered for participation if received from other Gymnastics Federations, State/Regions or upon special invitation from Gymnastics NZ. The Entry and Dispensation submission deadline is Sunday 18 August.